Hello and welcome to my card blog! This blog is my pet project that is about everything cards. Reading cards, playing the cards, as well as card design; I love everything about them and since they play a very big part of my life I thought having a personal blog about them would be fun and perhaps some of my experience can be offered to others. So a little bit about me: My name is Bethalynne and my long time friends know me as Blue. I’ve been a commercial artist since my early twenties (that would be the mid 90s to date myself) using that work to support myself as I worked and self published my personal projects on the side. I do a little bit of everything: Write, make art, design, and I’ve been known to wield a pretty strong web design & programming hand. Since 2013 I’ve been working on my family business The Attic Shoppe Trading Co. This is a shoppe where we sell all manner of things but specifically our own tarot, lenormand, and specialty card decks. We sell online, at conventions, and can be found at art & craft shows in the Midwest. I work a lot and I always have something going on so I don’t get a lot of down time. What down time I have is usually devoted to better learning the craft of cartomancy. This has become a very enthralling passion for me. When I made my first tarot deck it was an extension of a graphic novel I was working on and the true symbolism of the tarot took a backseat to my own fiction. As I’ve grown older and come to create other decks, I’ve really invested the time and enthusiasm into studying the history of this thing that is cartomancy and all the many ideas that have been used for it throughout the centuries. So part of this site is simply sharing those things as I learn and become more familiar with the cards myself. The second reason for this site is more of a practical thing. I’ve designed eight (more to come) different specialty decks over the past ten years, as well as helping with the design and formatting of three decks created by friends. I currently have two new decks in the works. Not only have I made every error along the way when it comes to creating and self publishing a deck, I have all the experience of doing things the right way through my experience and error. For a few years now I’ve happily shared my knowledge of the process with others to help them with their deck projects and I thought it would be worthwhile to put all of that knowledge into one place so that it might help others. I also wanted to document the process of creating my new decks. Photo Credit: After 20 years as friends and then an engaged couple for a decade, July 4th of 2018 my artist gent Myke and I got married in that backyard I speak of in my brief bio. 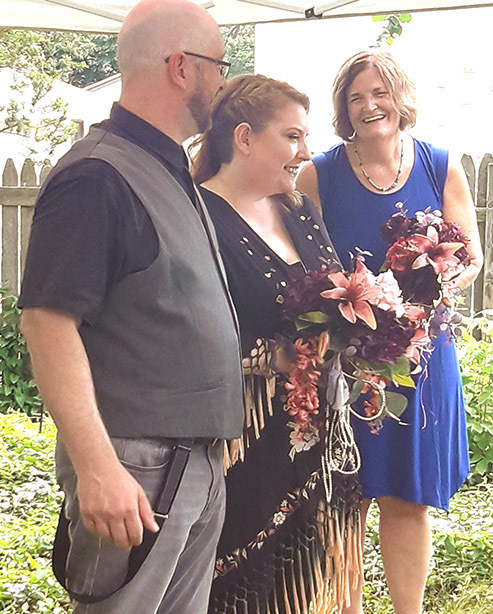 Our friend Ted Jauw married us as my family and good friend Kate Jauw looked on, with my new (and so beloved) sister-in-law Sara acting as my maid of honor. It was such a great day! And I treasure being able to use it as a window into seeing/knowing me. 🙂 And my awesome niece Emily, born ten years near to exactly the day of my own birth date (my gift at ten!! ), captured this photo. We look happy and that is all you can want from a very spur of the moment wedding day. Seriously! !